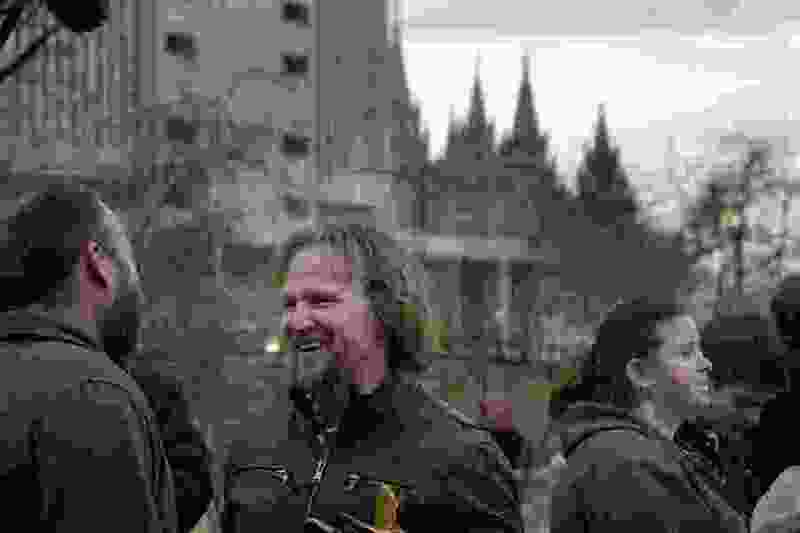 (Scott Sommerdorf | The Salt Lake Tribune) Polygamist Kody Brown and his family marched across State Street near the LDS Church Office Building in order to meet up with other polygamists and supporters before marching to the Capitol, where they held a rally, Friday, Feb. 10, 2017. A case alleging Mitchell Kyle Henderson beat up his first wife — after marrying a second, “spiritual” spouse — is headed toward trial, and television’s most famous polygamist may testify. Kody Brown, star of the reality show “Sister Wives,” is listed as an expert witness for the defense. A court filing says Brown will testify about the polygamous church he has attended, the Apostolic United Brethren (AUB). Brown would be countering the testimony of a prosecution witness who will describe the AUB as patriarchal. Henderson, a longtime friend of Brown, is charged in state court in Provo with six felony counts, including accusations of assault, domestic violence, witness tampering and violation of a protective order. Each count carries up to five years in prison. Jury selection is scheduled to begin Sept. 11. Henderson’s lawyer, former Utah Attorney General Mark Shurtleff, doesn’t want to have to call Brown as a witness. Shurtleff said he will file a motion asking the judge to ban any references to polygamy from the trial. Shurtleff, in an interview Tuesday, said polygamy shouldn’t have anything to do with whether the 50-year-old Henderson beat up his wife. Henderson’s first wife — the woman prosecutors say he assaulted — said Tuesday that polygamy should be a topic at the trial. “This whole thing is about polygamy and control and abuse,” Nicole Van Tassell Henderson said. Brown declined to comment Tuesday because the trial is pending. The case against Kyle Henderson — he goes by his middle name — has been around for two years and has already influenced Utah’s polygamy law. His father-in-law is Utah Sen. Kevin Van Tassell, R-Vernal. Chris Detrick | The Salt Lake Tribune Utah Sen. Kevin T. Van Tassell speaks about HB99 during Senate Floor Time at the Utah Capitol, Thursday March 9, 2017. Kyle Henderson entered into a “spiritual marriage” with a second woman in 2012. Records from Henderson’s criminal case suggest it was jealousy that sparked what prosecutors allege were assaults against Nicole Van Tassell Henderson, his legal wife. On April 10, 2016, the husband believed Van Tassell Henderson was communicating with another man “and attacked her,” according to a probable cause statement. About six weeks later, Kyle Henderson threw a beer can at her and caused what the statement says was a “hairline fracture” in her arm. On July 5, 2016, she spoke to a neighbor without his permission, the statement adds, and he kicked her. 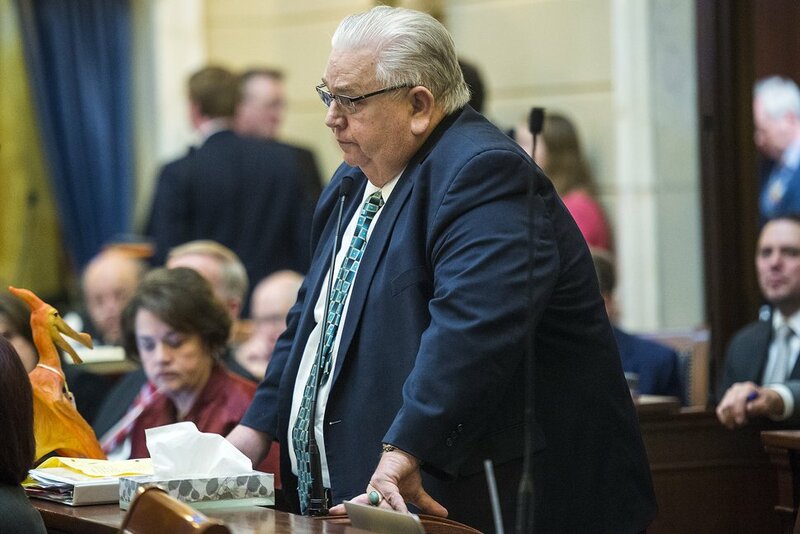 On the last night of the 2017 Legislature, the Utah Senate was considering a bill, already approved in the House, amending the definition of bigamy and increasing the penalties in some cases. The bill was meant to fix problems a federal judge found with the state’s bigamy statute after Brown and his family filed a lawsuit challenging it in 2011. To persuade his colleagues to vote for the measure, Van Tassell showed them photos of his bruised daughter, who sat with her father on the Senate floor for part of that night. Van Tassell and prosecutors allege Henderson caused the bruising when he assaulted his wife. Some of Nicole Van Tassell Henderson’s own children went to the Capitol to speak to lawmakers and tell them their mother concocted the story. Some of those kids are also expected to testify on their father’s behalf at the criminal trial. Francisco Kjolseth | The Salt Lake Tribune Kayla Henderson and her brother Nick, grandchildren of Sen. Kevin Van Tassell, R-Vernal, write notes in opposition to HB99, the bigamy bill, at the Utah Capitol during the last night of the legislative session, Thursday, March 9, 2017. Sen. Van Tassell's grandchildren from his daughter who has been in the Apostolic United Brethren were at the Capitol to refute what Van Tassell said about their father. At the Capitol in 2017, the children’s story failed to sway enough senators. The bill passed. Gov. Gary Herbert later signed it. The children’s testimony appears to be what is spurring the motions for expert witnesses at the criminal trial. Prosecutors want to call Kristyn Decker, a former plural wife in the AUB who lobbied for the 2017 bill. She is expected to testify the AUB is patriarchal, and the Henderson children have been conditioned to support their father. If Decker is allowed to take the stand, Shurtleff wants to rebut what she would say by calling on Brown and Anne Wilde. Wilde is also a former plural wife and has studied polygamy in Utah. Shurtleff said he also plans to conduct a poll of Utah County residents’ views on plural marriage. If 4th District Judge Christine Johnson permits polygamy to be discussed at trial, Shurtleff said he will be prepared with an expert who will know what questions about plural marriage to ask potential jurors. But Shurtleff said he would rather keep the focus on how he really believes Nicole Van Tassell Henderson received bruises and scratches. Shurtleff said the children are prepared to testify her mother was bruised when she moved a freezer and that a dog she took to the veterinarian scratched her. “I’m feeling really good about the case,” Shurtleff said. 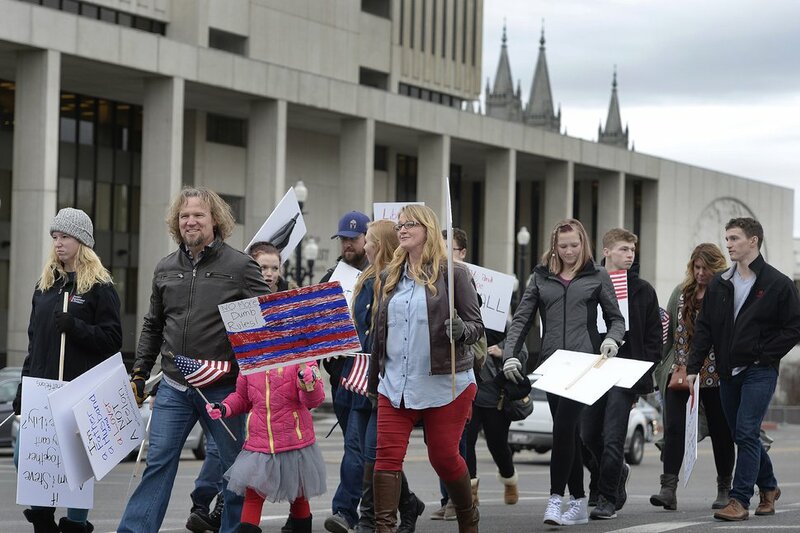 Scott Sommerdorf | The Salt Lake Tribune Polygamist Kody Brown and his family marched across State Street near the LDS Office Building in order to meet up with other polygamists and supporters before marching to the Capitol, where they held a rally, Friday, Feb. 10, 2017. Nicole Van Tassell Henderson said it’s her children who have been shifting their stories. That night at the Legislature in 2017, she said, the children told lawmakers she was bruised in a snowmobile accident. It also won’t be Brown’s first time supporting Kyle Henderson. The two have known each other since joining AUB. They served missions for The Church of Jesus Christ of Latter-day Saints at the same time — Brown in Texas; Kyle Henderson in North Carolina. By the time they returned to Utah, their parents had joined the AUB. The sons soon followed. The LDS Church officially abandoned polygamy in 1890 and excommunicates members found practicing it. When LDS leaders held a disciplinary council for Kyle Henderson, his wife said Tuesday, Brown was asked to be a witness in support of his friend. Kyle Henderson was excommunicated anyway. Van Tassell Henderson worries the jury at the criminal trial will be awestruck by Brown. Van Tassell Henderson and her husband have 13 children. The seven youngest are minors living with their father. Van Tassell Henderson said the criminal case has delayed her divorce. The parties are waiting to see if Kyle Henderson is convicted of a domestic violence charge before final custody is awarded. Shurtleff said prosecutors have offered his client a plea deal, but Kyle Henderson rejected it because it would have required him to plead guilty to domestic violence, which could affect the divorce and custody case. Kyle Henderson also is charged with two felony counts of extortion or bribery. Prosecutors allege he tried to persuade his wife to change her testimony in the case alleging domestic violence. Shurtleff said Kyle Henderson told his wife only to tell the truth. A separate trial on the extortion and bribery charges is scheduled for Aug. 28 in state court in Provo.